The expedition level Explorer Series of inflatable kayaks from Sea Eagle are rugged, designed for long float trips, can handle Class IV whitewater and can carry loads of gear. In short, as their name suggests, the Explorer Series kayaks are meant for long float trips through remote areas and for running powerful whitewater rapids. Of course, this doesn’t mean these kayaks can’t be used for other purposes. An Explorer Series kayak, the 380x, is what I own and I use for day trips, lake paddling and fishing. In many ways, the expedition level inflatable kayaks are the “workhorses” of the inflatable kayak world, as they can pretty much do anything. For more information about expedition level kayaks, please read the following article : What Is an Expedition Level Inflatable Kayak? Since expedition level inflatable kayaks are so versatile, and Sea Eagle’s Explorer Series kayaks have become increasingly popular leading to more models to choose from, I created this article to compare the similarities and differences among the four different models of the Sea Eagle Explorer Series of inflatable kayaks. The goal of the article is to help people interested in purchasing one of these fine kayaks purchase the specific model that best meets their needs. 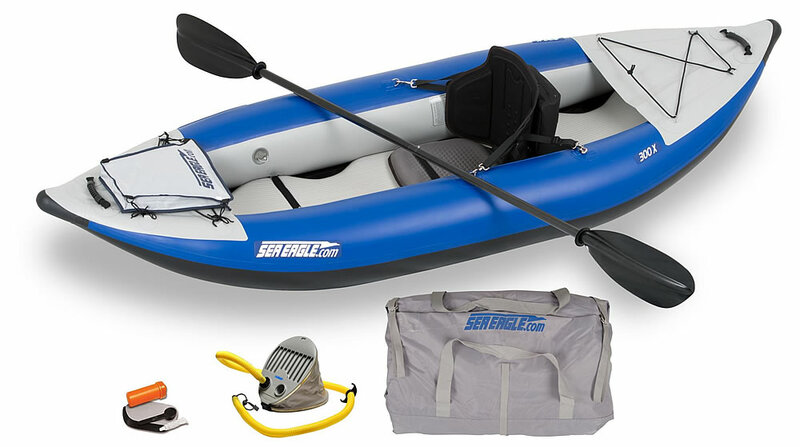 All Sea Eagle Explorer Series inflatable kayaks share the following features. As seen from the list, the four models of Explorer Series kayaks share much in common. Where they differ is in terms of their “ideal uses.” What determines their ideal uses is the boat’s length, weight capacity and several other integrated features. So let’s explore the primary differences among these four Sea Eagle kayaks. Of all the inflatable kayaks Sea Eagle makes, the 300x Explorer is the true “play” kayak. So what do I mean by that? Simple. This kayak is specifically designed for tight turns, quick draining of water and superb maneuverability. This design makes the kayak ideally suited for running powerful whitewater rapids and playing in large ocean waves. Like I said, the play kayak. The kayak accomplishes this by being quite short in length, at just 9 ft 10 in. The short length allows for sharp, precise turns when running rapids or paddling among ocean waves. And when water pours into the boat, the 16 drain valves drain the water away quickly. Owing to the boat’s short length, the 300x is designed for one paddler only. The kayak also only has a weight capacity of 400 lbs. For a solo paddler playing in the waves or the rapids, the weight capacity isn’t an issue. But if you want to use this kayak on long, overnight float trips, the short size and relatively low weight capacity does limit what gear you can bring. In short, this isn’t the kayak to use for a week-long float trip. While this kayak can do long float trips, there’s better choices available (aka…the 380x). Instead, the 300x is an ideal day use inflatable kayak for intense water play – such as paddling among the ocean waves and running whitewater rapids. 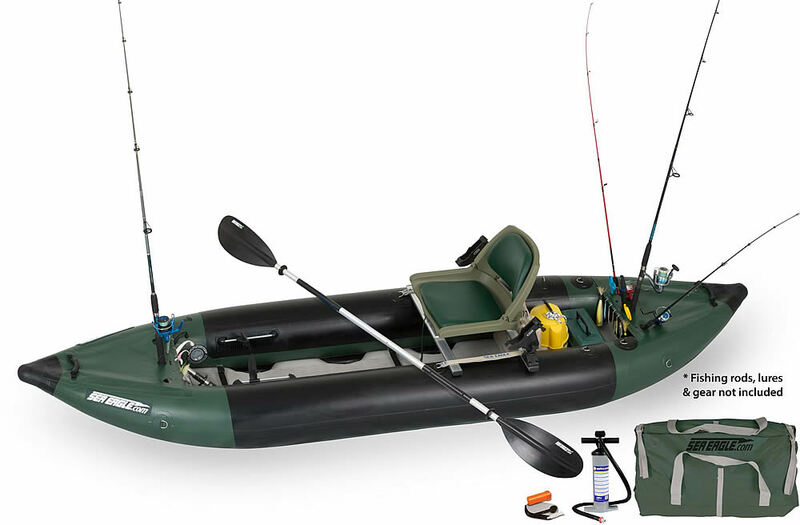 The kayak can also pull double duty as a solo fishing platform, especially if some of the upgrades (such as the frame and swivel seat) are added. 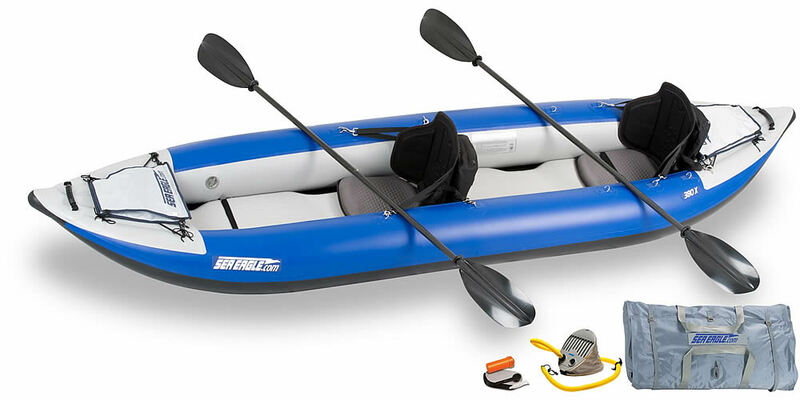 And finally, like all other Sea Eagle expedition level kayaks, it is perfectly suited for solo recreational floating. And even for solo paddlers, there’s still plenty of room for a dog to tag along, too. In sharp contrast to the 300x, which is meant for big wave and whitewater play, the 350x is meant for fishing. Unlike other Explorer Series kayaks, the boat is green, which helps it blend into the surroundings a bit more (although to the fish, the color is immaterial). Designed for one angler, a simple glance at the 350x says everything you need to know about it. It’s a fishing rig. It’s green. It has rod and lure holders. Anglers can attach all sorts of accesories to the boat, including a frame with a swivel seat – which also provides a high seating position. The 350x also accepts a motormount, allowing for the use of trolling motors (no gas motors, sorry). One slight difference between the 350x and other Explorer Series kayaks is the reinforcing 2000 denier fabric in the middle of the boat. In the photo above, this reinforcing fabric is the “black” part of the boat. This reinforcing fabric is designed to foil all hooks and knives in their quest to puncture the boat. The 350x is longer than the 300x, with a length of 11 ft 6 in. It also has a higher weight capacity to reflect the longer length, with a capacity of 575 lbs. The longer length and higher weight capacity allows this boat to be used by two people for recreational floating. For solo paddlers, the longer length and greater weight capacity allows for long float trips with piles of gear. The most versatile of the Explorer Series of kayaks are the 380x and the 420x. Both kayaks can run whitewater up to and including Class IV. They just can’t run it quite as well as the smaller 300x. Both kayaks also work perfectly well as a fishing platform, although they lack some of the goodies found in the 350x. And while these kayaks are fine for whitewater and fishing, make no mistake, these kayaks are designed for long trips through remote territory. Their large weight capacity, bullet proof design and ease of hauling gear makes these kayaks a top-end expedition level inflatable kayak. The only differences between the 380x and the 420x are their lengths and weight capacity. The 380x is 12 ft 6 in in length and has a weight capacity of 750 lbs. The 420x is 14 feet in length and has a weight capacity of 850 lbs. The two differences in length brings up an obvious question. Which to get? The answer depends on how many people will use the boat. The 380x is primarily a one or two-person kayak. While it is capable of having three paddlers in the boat, it will be a tight fit. And with three paddlers, there’s little spare weight capacity, or space, to haul much gear. If you’re a solo paddler, stick with the 380x. The shorter length when compared to the 420x makes the 380x much simpler to maneuver, both in rapids and on flat water. Moreover, the huge weight capacity of the 380x provides bountiful options for bringing all the gear you could ever want. The 420x is just a bit too long, too sluggish and too heavy for solo paddlers through serious whitewater. Solo paddlers can paddle the boat fine across lakes and take it down more sedate rivers. But the length of the 420x will simply make it more difficult for solo paddlers to control the boat when floating through serious (strong Class III or greater) whitewater. For couples, especially those who will be taking lengthy overnight trips, I’d lean towards the 420x. Here’s why. On long voyages, the extra interior room is always nice. It increases comfort. And the extra length also increases the ability to creatively store any gear you bring along. Finally, the additional weight capacity gives paddlers more flexibility in what they bring. And even on day trips, the additional interior room found in the 420x is always helpful. More comfort during long floats is never a bad thing. For couples who plan to take long overnight float trips, the 380x works just fine. Just expect conditions to seem “more cramped,” especially after a long day of paddling. Finally, if you’re taking pets along, the 420x is mandatory. A couple in a 380x will have the dog sitting on someone’s lap or legs, which isn’t exactly helpful for comfort or paddling productivity. However, there are two reasons couples might still want a 380x instead of the 420x. The first is if the couple plans to run serious, Class IV whitewater. The shorter length of the 380x makes it easier to turn and maneuver in fast moving whitewater. The second reason is if the couple expects to frequently paddle “solo” using the boat while running whitewater. The 420x is just a bit too long for solo paddlers to take through serious whitewater.